What camera do YouTubers use? This question revolves around the mind of millions of people, as they want to create outstanding videos to engage with their audience. If you are also pondering this question, keep on reading. Beginner? Want to upgrade your status on YouTube? Well, we comprehend your concern. There are thousands of cameras to choose from. They are not only affordable, but also packed with high-end options. However, the issue is, particularly for a beginner, it is nearly impossible to find out which is the best for vlogging or YouTube videos. We have spent countless hours on this subject and talked to many famous YouTubers in the industry in order to find out which camera is the best for YouTube in particular. Here is our recommendation: Nikon D3300 24.2 MP Digital SLR It is one of the most popular DSLR video cameras.Especially, among YouTubers, it is rated very high because of its A++ video quality and lower to middle price range. Plus, it is pretty compact and lightweight too. You can not only travel with it, but also record full HD outdoor movie like James Cameron. It is a great starter DSLR camera for anyone looking to get into YouTube. If you are on the verge of making a decision, but want to know more about this camera, below are some key features that will compel you to purchase it straightaway. The Movie Mode: We perceive, this is the first, and the most important, feature you all want to know. It produces excellent, HD videos at its highest resolution and 60p frame rate. Colors are always vibrant with soft blurred backgrounds that create more stunning effect. Though, keep in mind the maximum clip record time is 20 minutes. Furthermore, the full-time servo AF, face detection, and subject tracking also activate once you start recording. Redesigned Guide Mode: Nikon manufacturers have redesigned the ‘Guide Mode’ in D3300. The key purpose is to offer easy operation for the beginners. Since, most people don’t know how to deal with advanced options or opt for the appropriate settings. The guide mode puts you into the ‘Sports Scene Mode’. In addition, the camera actually becomes your guide too; it asks whether you want to use ‘live view’ or ‘shoot a movie’. Studio Comparison: Most video cameras are efficient in one single category. For example, if they are excellent at daytime shooting, the quality of their video compromises at low-light shooting. However, luckily, this isn’t the case with Nikon D3300. It is perfect for both daylight and low-light shootings. Even in low-light shows, it challenges the performance of top-notch cameras and captures the low-contrast details quite well. There are two different models that often baffle people – D330 and D3200. Since, the difference between both of them is subtle. Professional YouTubers comprehend it so well, but for a beginner it is tough to notice. If you are also confused between these two, allow us to reveal their subtle differences in a head-to-head comparison chart. The continuous shooting speed of Nikon D3300 is 5 frames per second. The continuous shooting speed of D3200 is 4 frames per second, which is still useful. It uses Expeed 4 processor. It uses older Expeed 3 processor. It produces ultra-fine details & textures better than Nikon D3200. It is also a great camera, but not as good as Nikon D3300 when it comes to details. The ISO range is better – 100-12,800. The ISO range is normal – 100-6,400. LCD Screen Resolution. Higher Resolution Screens. It offer face-detection focus. It is very handy for portraits. There is specifically microphone port in it. It has high quality audio recording option. 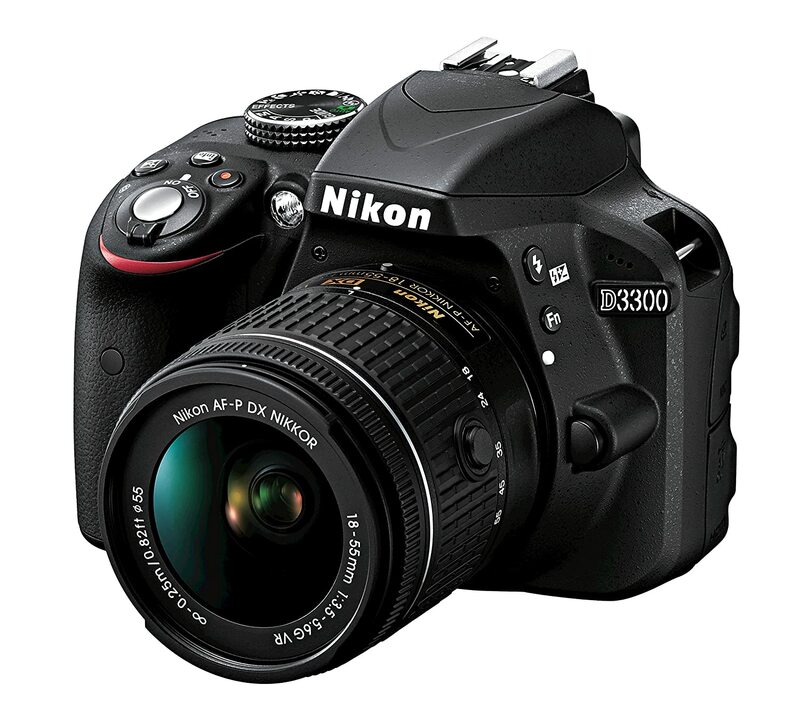 On the whole, Nikon D3300 is a beginner + professional level camera. On the other hand, the Nikon D3200 can be considered as a beginner level camera only. If you want to expand your creativity and give solid performance on YouTube, get D3300. Its next-level results turns you into a professional YouTuber. Plus, its overall operation is easy-to-understand. For example, there is programmable Fn button. If you want to set image quality or control the lighting menus, press it & set the options according to your requirement. This button lies right under your left thumb. Next, there are lots of buttons on its back, such as menu, zoom in/out, navigational control and etc. You can utilize their purpose according to your video requirement. In addition, you will find lots of special effects on a single tap which you can utilize in making your videos more stunning and attention-grabbing. Nikon D3300 features Expeed 4 processor to capture the finest images. It captures full HD moves at frame rate up to 50/60. The display size is 3 inches. 8.9 watt hours lithium battery energy. It is powerful, comfortable to carry, and effortless to operate. It records moves with continuous autofocus. You can send images straight from the camera to a smart device. If you are new, the ‘Guide Mode’ will offer step-by-step assistance. The image sensor makes the most of its 24.2 mp resolution. Even in the dark, low-light situation, it produces outstanding results. Firstly, and most importantly, it is compatible with Windows 7 & 8. You don’t have to download any extra software. Just attach the USB cable and download the files from memory card. However, remember that it doesn’t come with the SD card. Therefore, if you are planning to buy a new memory card, experts recommend SD card Class 6 or above. In addition, it is better to use the capacity of 512GB, if you are professional, or planning to shoot a lot of high definition videos for YouTube. Lastly, you can’t charge the camera via the USB cable. It is pertinent to charge its batteries with the dedicated actual charger. Nikon D3300 24.2 MP Digital SLR is the best camera for YouTube. It deliver superior image stabilization and quality. You will experience four times more the level of details that you get from other full HD cameras. Apart from this, it doesn’t just capture visually beautiful videos, but also deliver professional sound quality. The clarity of sound is as great as the high-definition video. All in all, it certainly ticks a lot of positive boxes for first time users.